I like to create a lxdbr0 bridge on my laptop so I can easily deploy LXD containers and, as I treat my laptop like a workstation, I hardly ever move it so I can use an ethernet connection instead of wifi for full gigabit local area network speeds. Setting up a bridge to a wifi device is somewhere between difficult to impossible and not worth the time spent Googling it (as convenient as it might be.) In the past I used the networking systemd service and more recently I tried systemd-networkd and both of those methods work fine but require manual editing of files and switching to mobile via NetworkManager (being disabled) is awkward. 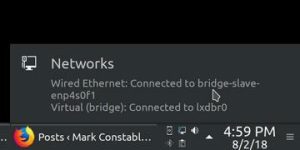 A couple of times over the last few years I’ve tried using the bridging facility within the network manager gui (plasma-nm in my case) and it mostly creates the bridge config files but never seems to connect to the slaved ethernet interface.